The KidKraft Designer Dollhouse is full of stylish details like a curved roof design, two spiral staircases and hip artwork in every room of the house. Childrens 12" Tall Kids Little Girl's Play Majestic Mansion Dollhouse Full of Fun!! 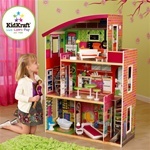 This is for one brand new KidKraft So Chic Dollhouse. The So Chic Dollhouse can be played with from all four sides and features an extraordinary amount of detail, making it a perfect gift idea for any of the young girls in your life.